Posted in: Earrings, Lyn D jewelry design, Necklace. 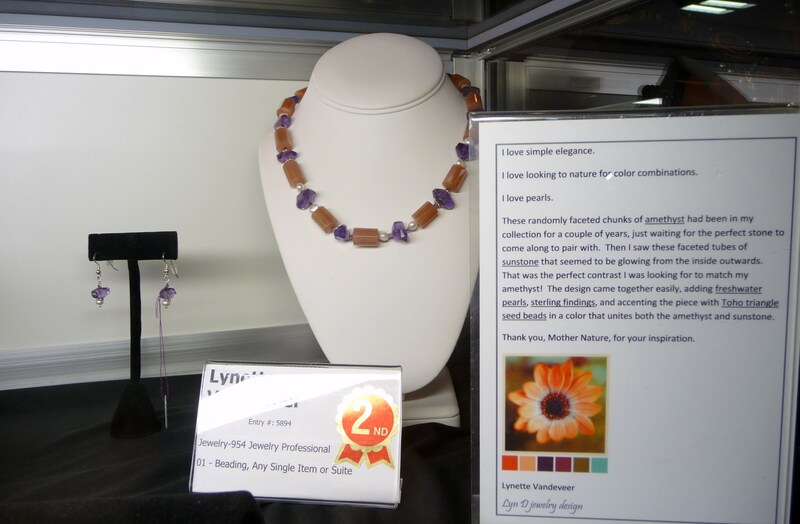 Tagged: amethyst, award winning, Lyn D jewelry design, Lynette Vandeveer, Orange County Fair, pearls, sunstone, toho. Well, it happened again. This summer I entered two of my designs into competition in the Professional Jewelry Design Category at the 2014 Orange County Fair. And this lovely gem took the red ribbon for second place! I am always amazed, humbled, and grateful when one of my pieces wins a ribbon. I put much thought and lovingkindness into creating my jewelry designs and I am always pleased when others appreciate the work I put into making them. A big thank you to the judges who also saw the quiet beauty in this piece.